AudioLava is the ideal audio cleaning software for restoring and recording high quality audio from LP or tape to CD. AudioLava automatically removes noise such as tape hiss or clicks and crackle on LP records with its state of the art noise reduction algorithms. 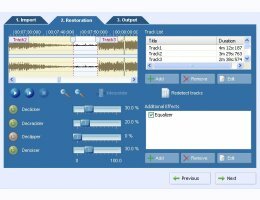 The user friendly Cleaning Wizard helps you to find the best way to bring your analog and digital recordings back to life in an impressive quality and guides you through all the steps from recording and track splitting to restoration and CD burning. With AudioLava you can easily enhance your audio files to a quality you have never heard before. The digital emulation of phono preamplifiers allows you to record your music signal without buying an additional phono preamplifier.